Walkers are being urged not to underestimate the Lake District's following two deaths in under a week. 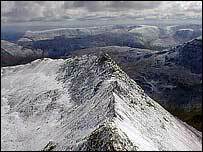 On Saturday David Burke, 41, from Newcastle died after falling more than 800ft from Helvellyn, England's third-highest mountain. Days earlier, a 62-year-old man was blown off the fell and killed. There is no suggestion that either walker was ill-prepared, but fell-top assessor Craig Palmer says it shows how treacherous the terrain can be. Mr Palmer, who climbs Helvellyn throughout the year to check weather conditions, says inexperienced walkers are most at risk. He said: "About 95% know exactly what they're doing, but even then it's easy to make a mistake. A simple trip or tumble can end in disaster. "If you're a winter walker or a mountaineer and you've been in this type of environment before, you can make your own informed judgements. "But if you're inexperienced and not sure whether it's safe to continue, you should really turn around." The Lake District's mountain rescue teams are frequently called out to walkers without basic equipment such as a compass or torch. For more risky ascents, or during severe conditions, full winter gear, including ice axes and crampons, is recommended.